Journey to The Force Awakens. The second Death Star is destroyed. The Emperor and his powerful enforcer, Darth Vader, are rumored to be dead. The Galactic Empire is in chaos. Across the galaxy, some systems celebrate, while in others Imperial factions tighten their grip. Optimism and fear reign side by side. And while the Rebel Alliance engages the fractured forces of the Empire, a lone Rebel scout uncovers a secret Imperial meeting. . . .
STAR WARS AFTERMATH captures that classic Star Wars feel by blending elements from Rebels, the original trilogy, as well as instilling a new trilogy feel to it - quite a feat to incorporate the full breadth of Star Wars into a single novel. The end result? A mix mash of fan favorite feel that readies the reader for the journey to The Force Awakens. AFTERMATH centers around a rag tag group characters new to the extended universe cannon. On first read this didn't work for me; I wanted a Stars Wars book that showed me what Luke, Han etc had been up to since Episode VI. However, once I got to know these characters I really started to enjoy the book, more-so with a second read. The new characters in Rebel pilot Norra Wexley, reconditioned battle droid Mister Bones (a personal favorite), Norra's son and all-round tinkerer Temmin (there is def a resemblance to a young Anakin here and his droid building) , ex-Imperial Loyalty Officer Sinjir , and assassin for hire Jas (another standout character in my opinion) all get sufficient page time to portray a background and develop their respective stories. On the second read of the book, each felt more real and belonging to the Star Wars universe. The plot, despite the many and varied elements, is essentially about the Empire's struggle to regain a shade of its former glory in the confusion and disassociation of ranks following the loss of Vader, the Death Star and a number of high ranking officials. Enter Rae Sloane, Admiral in the Empire and chief antagonist who has a special something about her. She's brought together the last few serious contenders to the Empire's throne to form a united front in the battle to reclaim the Empire's stranglehold on the universe. On a little known plant this gathering should go un-noticed - yet it's not. Sloane first appears A NEW DAWN, I suggest readers check out that book first to gain an appreciation of the character. Author Chuck Wendig showcases political, military, and social elements to the aftermath using interludes which also tease with cameo appearance of fan favorites such as bounty hunter Degar and well known characters like Han Solo and Chewie. I enjoyed these snippets for the most part but felt the continued and more frequent interruptions in the later stages of the book were a cause for destruction to the main story. Some well known ancillary characters from the movies have prominent roles in AFTERMATH, notability Wedge Antillies - the rebel pilot on a solo mission who stumbles across a secret meeting of Empire elites (or what constitutes 'elites' in the wake of the Death Star's destruction) on outer rim planet Akiva. And Admiral Ackbar who is head of military operations for the Rebel Alliance. 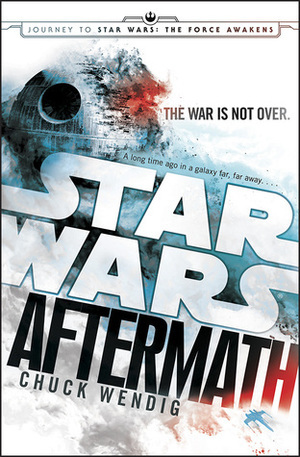 AFTERMATH is a solid entry into the new Star Wars cannon and one worthy of a re-read. I found myself enjoying the book far more on the second go-round. The rotating perspective made it difficult to get into. It took a long time for me to be able to keep the characters straight. The last third of the book was entertaining though and I'm looking forward to following these characters into the following books.